On Purpose Chiropractic is an upbeat, positive place with an approachable, compassionate team. Too often these days, customer service is a disappearing art form. We want to change that and make sure you know that we care, giving you the love, positivity and empathy that we know goes a long way in the healing process. 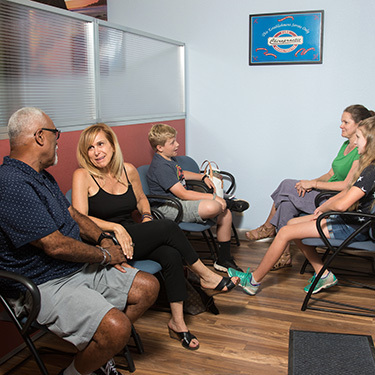 At your first visit, you’ll sit down with Dr. Kleinberg to discuss your problems and concerns, along with any questions about what we do. We’ll perform a simple physical examination next, making measurements that we can retake later to determine your progress as we begin care. Usually, we’ll take digital X-rays in our on-site suite to assess your spine. Then, we’ll invite you back for an individual report of findings. At that time, Dr. Kleinberg will go through your X-rays, discuss corrective chiropractic and the most powerful benefits you and your family can get from what we do. If you’re ready to begin, you’ll receive your first chiropractic adjustment. Schedule your appointment with us today! Same-day visits are available.